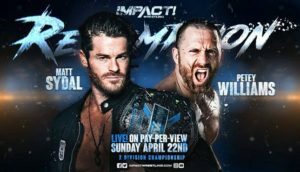 IMPACT Wrestling presents Redemption tonight, live from the Impact Zone in Orlando, Florida. 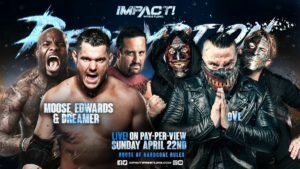 A total of eight matches are announced, including the much anticipated triple threat (re)match between Impact World Champion Austin Aries, Pentagon Jr, and Fenix. The promotion has debuted new championships (Tag Team, Knockouts, X-Division, World), and a new stage/set. Keep Refreshing For The Latest Results! 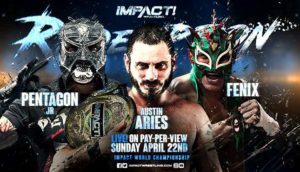 Austin Aries (c) vs. Pentagon Jr. vs. Fenix: NEW Impact Wrestling World Champion Pentagon Jr.
Redemption opens up with the cold opening. Drago vs Aerostar kicks us off tonight as Drago makes his way to the ring. Aerostar makes his way to the ring next. Collar and elbow tie up with a go around and Aerostar gets the upper hand with a headlock but Drago turns it around into a wristlock hold on Star. The match starts to pick up the pace just a tad with back and fourth counters. 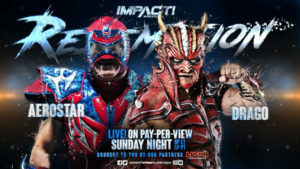 Aerostar dodges Drago and connects with kick to the chest. Aerostar kicks Drago in the face while he’s in the ropes. Fast forward a bit and Drago launches Aerostar with his feet from the corner and follows up with a kick to the head. Back and forth we go and Aerostar is driven out of the ring and Drago follows it up with twisting tope con hiro and throws Aerostar back in the ring for a two count. Drago stays on Aerostar and flips he over into the seated position and connects with a kick to the back of the head. Drago picks up Aerstar to follow but Aerostar counters and gains control of the March sending Drago out of the ring and hitting his signature move La Bonetia and gets a two count. Back and forth ww go with multiple covers only getting two counts. Both guys have the same idea in their heads as they hit double clotheslines and both men are down. Aerostar comes charging in at Drago but he counters with a back breaker across the knee followed by a kick to the side of thehead. Drago then hits a hangman’s DDT for a two count. Drago hits multiple shots on Aerostar but Aerostar pushes Drago out of the ring and follows with a tope. Star rolls Drago back in the ring and covers him for a two count. Aerostar stays on Drago but comes up empty and Drago knocks down Aerostar for a two count. Drago puts Aerostar in the La Miestra cradle for a two count. Aerostar is planted with a powerbomb and looks to go for another but wastes time and allows Aerostar to counter and hit a springboard neckbreaker. Aerostar hits Drago with a flying codebreaker for the pinfall victory. Backstage segment showing Josh Mathews and Matt Sydal talking and Matthews saying that Sydal has fully blossom and doesn’t need him anymore. He also wishes him luck in his title match tonight against Petey Williams. LAX is shown in the clubhouse getting ready for their match. They get a call and apparently someone has taken out Konnan but they don’t know who. They now have to refocus and get ready to defend their titles. Eli Drake makes his way to the ring and debuts a new theme song. Scott Steiner makes his way to the ring for the match. LAX make their way to the ring without Konnan. LAX is jumping at the bit to get at Eli Drake as the ref holds them back. Collar and elbow tie up and Eli pushes Santana into the corner. Drake begins to trash talk Santana and regrets it immediately and finds himself in enemy territory. Ortiz tags in and they hit double team maneuvers for a two count. Drake fights back and hits a knee to the gut of Ortiz. Steiner and Eli hit a double team maneuver which knocks Ortiz out of the ring and Eli follows him out and knocks him down. Drake throws Ortiz back in and tags in Scott who gets a one count. Stiener hits a big move on Santana and then the same move on Ortiz. Drake tags in and hits his signature elbow for a two count. Ortiz begins to fight back and Steiner tags himself in but gets pushed into a corner and eats a boot for his troubles. Both Ortiz and Steiner tag out and Santana fires off on Drake. 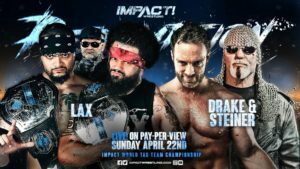 LAX begins their double team maneuvers for maximum impact but Steiner stops them in their tracks and hit a overhead suplex on Santana. Steiner sets Santana up on the top rope and hits a frankensteiner. Scott tries to lock in the Steiner recliner but Ortiz comes back in and breaks it up. Down the stretch Scott Steiner was taken out but Santana and Drake hits the gravey train on Ortiz for the pinfall victory. Everyone makes their way to the ring for the match. DJZ and Dezmond Xavier start the match and DJZ gets a wristlock on Xavier. Dezmond counters and gets a side headlock on DJZ. DJZ counters and puts Xavier in a headlock of his own. The match begins to pick up a bit and Dezmons hits a dropkick on DJZ which kicks him into a corner. DJZ knocks Ishimori off the apron with a flying senton flip. Since DJZ went to the outside Trevor Lee gets in the ring and thinks he tossed Xavier out of the ring. Xavier toss Lee out of the ring and Fantasma enters the ring. This match takes off and the two men that become legal are Ishimori and Fantasma. Ishimori hits a springboard senton. Ishimori gets taken to the outside and Trevor Lee comes in and gets a two count on Fantasma. The match breaks down and Lee has now attacked Cage twice but he’s still on the apron while everyone is down. Cage finally gets in the ring and hits multiple clothesline to Trevor in the corner. Xavier enters the ring and almost gets thrown out of the ring for his troubles. Fantasma and Ishimori try to take out Cage who fights back and hits a springboard moonsault on Taji. Cage is eventually sent out of the ring and DJZ hits a DDT to the outside of the ring taking out Cage. 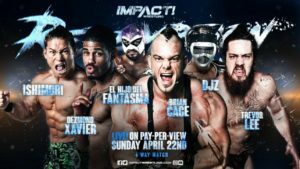 The match is fast and furious as Xavier and Fantasma work together to take out Brian Cage to no avail. Trevor Lee enters the ring and counters him for a two count. Down the stretch Cage takes out Lee, Fantasma and hits the Drill Claw on Dezmond Xavier for the win. Taya Valkyrie makes her way to the ring. Kiera Hogan makes her way to the ring for the match. Taya pushes Hogan down to the mat. Hogan uses her speed against Taya but she knocks her down with an elbow. Kiera fights back and hits a hurricanrana on Valykire in the corner. Kiera keeps it up on Taya and hits a springboard move on Taya. The match spills to the outside but Taya eventually regains control. TESSA BLANCHARD JOINS THE COMMENTARY TABLE MIDMATCH. Taya stays on Hogan but Kiera fights back for a bit but Taya counters and hits a big move for a two count. Taya then hits Kiera with a big knee for another two count. Kiera tries to fight back while Taya holds her hair with multiple elbows. Hogan breaks free and hits a huge double sledgehammer on Taya for a two count. Taya rushes Hogan in the corner but Kiera counters and stomps down Valykire. Taya fights back and hits a big suplex for a two count. Taya has had enough of Kiera and clubs Hogan in the back of the neck with multiple elbows in the corner. 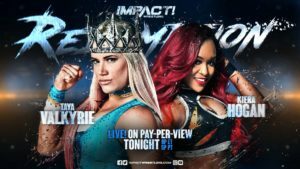 Taya Valkyrie eventually hits the Road to Valhalla for the win. Petey Williams makes his way to the ring for the championship match with his feast or fired briefcase. Matt Sydal makes his way to the ring to defend his title. Collar and elbow tie up and Petey goes for the go behind Sydal counters and takes down William’s with a headlock then turns it into a head scissors. Sydal then puts a submission on Petey but Williams breaks it and gets Matt in the corner and hits a gut shot on Sydal. Matt counters but Petey then counters and sets up Sydal on the top rope and hits a hurricanrana. Petey sets Sydal in the tree of woe and steps on his no no area then a superkick on his knee. Petey continues the aggression and attacking the lower body of Matt. Sydal eventually gets control of the match and wears down Petey. Sydal hits a standing moonsault on Petey for a two count. Petey is thrown into the corner and Sydal rushes in but eats an elbow for his troubles. Petey hits a big move and both men are down for a moment. The match picks back up a bit as Petey hits a big Russian Legsweep. Both guys go back and forth and Sydal gains control and knocks Petey in the corner and hits a sliding knee on Petey. Sydal tires to go for a hurricanrana but Petey counters and locks in a submission on Sydal. Matt breaks free and goes to the apron to recover but Petey meets him out their hitting a slingshot code breaker knocking Sydal to the floor. Williams throws Sydal back in the ringgit Sydal counters and hits a big knee then a hurricanrana. William’s fights back and hits the Canadian Destroyer but Matt rolls out of the ring. Petey follows and drags Sydal back in the ring and goes for a super Canadian Destroyer but Matt holds on and eventually hits a pumphandle slam for the pinfall victory. oVe makes their way to the ring for the match followed by Tommy Dreamer, Moose, and Eddie Edwards. What makes this a little interesting all the competitors are in street clothes. Jake Crist is caught mid dive and powerslammed into the apron. Sami Callhian comes in to attack but taken down. The faces grab the toys and get started taking out oVe. Dreamer connects with a cookie sheet to Jake Crist and then sets him up in the tree of woe. Dreamer was about to hit Crist with a chair but Sami comes in and hits a big boot taking out Tommy. Sami takes out Eddie and covers him for a two count. Moose comes in and hits a pop up powerbomb on Callihan. Moose goes for a tope con hilo but lands right on the ladder. Dreamer and Eddie back inthering locks in submissions on the christ brothers. Sami gets back in the ring to make the save. Callihan instructs the Crist Brothers to get the the tables. They set up two tables on the outside. oVe have Eddie all alone inthe ring and go on the attack but Eddie fights back until Sami hits him in the head with a trashcan. The Crist Brothers hit the all seeing eye on Eddie on top of chairs and they cover him but Moose makes the save. Moose is on fire right here as he knocks Sami off the top rope with a dropkick. Moose then sets a trashcan in front of one of the Crist brothers and hits a dropkick. On the outside Dreamer puts Sami Callhian through a table via death valley driver. Dave Crist introduces thumbtacks into the match but ends up going through them thanks to a knee from Eddie. Dave Crist is set up on a table and Moose looks to put him through a table but midjump eats a cutter from Jake Crist. Back in the ring Eddie and Sami trade blows but Callihan hits the get out of here for a two count. Sami grabs his baseball bat but Dreamer makes the save with a barbed wire bat and hits a DDT. Sami hits a lowblow on Dremer to secure the win. Post match Eddie puts the barbed wire bat over Sami’s eye and busted him wide open. Eddie then tapes Sami to the ropes. Eddie then kicks Sami in the groin and follows up with multiple shots with a kendo stick. The ref tries to break it up but ears a kendo stick of his own. 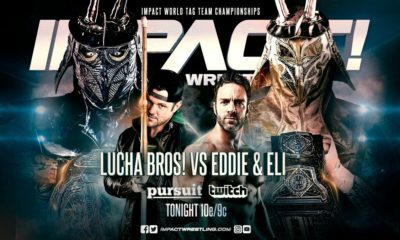 Dreamer tries to stop Eddie but eats a Kendo stick shot then Jake Crist. Eddie’s wife Alisha enters the ring to stop him and turns around and accidentally hits his wife with the kendo stick. Braxton Sutter introduces Su Yung and she makes her way to the ring. Allie makes her way to the ring to defend her title. Su Yung gets the jump on Allie as Allie was trying to get Braxton to go to the back. Allie fights back and hits the thez press on Yung followed a hair toss. Allie gets distracted by Sutter and Su tries to take advantage but Allie is having nothing of it. 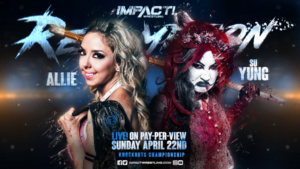 Allie goes to the top but gets distracted by Braxton which drops her into the tree of woe postion and Su Yung goes on the attack. The match spills out of the ring and Yung removes her bloody dress and hits a rolling senton. Yung drags Allie back in the ring for multiple near falls. Su puts on a body rubber glove and tires to use it but Allie counters with a code breaker and both ladies down. Su props herself in the corner and Allie hits big elbows on Su but Allie gets caught by a big elbow from Yung. Allifights back and hits a russian legsweep for a two count. Allie goes for the BSE but misses and Su hits a tiger driver for a two count. Allie eventually hits the BSE but Sutter gets on the apron to stop the pin. Su Yung from behind tries to hit the paincswitch but Allie counters for the pinfall victory. Post match Braxton says he can fix the situation and proposes to her. Su Yung answers with the red mist to his face then puts the mandible claw on him. Pentagon Jr. makes his way to the ring for the main event. Fenix makes his way to the ring second. The belt collector, the world champion Austin Aries makes his way to the ring last. McKenzie Mitchell makes formal introductions. The bell rings and Pentagon soaks in the crowd. A little bit mind games between the three then the match gets underway. Aries knocks down both men and boxes both of their ears. Aries then scouts the move they used in New Orleans to knock him out of the ring last time and slides out of the ring to dodge it. The match picks up speed and Aries eventually locks in the last chancery but Fenix breaks it up by launching himself onto both men and Pentagon rolls out of the ring. Fenix stays on aries but Austin fights back and hits in elbow on Fenix for a two count. Pentagon gets back in the ring but gets blocked by Aries. Fenix is knocked down and allowsfor Aries to lock in the last chancery again on Pentagon but Fenix rolls over Aries to break it up. Aries boxes Pentagon’s ears and knocks him out ofthe ring Fenix tosse Aries out of the ring but Aries counters and hits a hurricanrana on Pentagon. Fenix hits a springboard triple axel to take out both men. The match is so fast and quick Pentagon finds himself with the opportunity of both men being down and goes for covers and gets a two count on both men. Pentagon then ends up on the outside leaving Aries and Fenix in the ring. Aries hits a big elbow then tosses Fenix over his head turning him inside out. Aries goes for a 450 but Pentagon breaks it upand knocks Aries to the floor. Pentagon then hits thelung lower. Fenix suckers Pentagon in and goes ont he hunt. With Pentagon on the top rope Fenix hits a spinning musclebuster for a two count. Pentagon comes back to life and hits the Pentagon driver but Aries breaks it up. The match eventually spills to the outside and tosses Pentagon into the crowd. Both menget back in the ring and Aries hits the 450 on both men for a double pin but only for a two count. Down the stretch Pentagon hits a gory special and package piledriver on both Fenix and Aries. Pentagon then hits the Pentagon driver on Aries for the win. Post match Pentagon Jr. and Fenix hug it out. Winner: NEW Impact Wrestling World Champion Pentagon Jr.
My opinion this was an amazing show from top to bottom. I enjoyed every single match and got some shocking results as I thought we would get more new champions. Where does Impact go from here? Find out this Thursday on Pop TV for all the fallout. Welcome to the era of Zero Fear! Johnny Gargano VS Roderick Strong; wins. Kassius Ohno VS Ligero; Ohno wins. Kay Lee Ray VS Xia Li; KLR wins. Moustache Mountain VS Flash Morgan Webster & Mark Andrews; Moustache Mountain wins. The bell rings and Ligero waits for Ohno as he stays in the corner. Ohno comes out and fans rally up as he ties up with Ligero. Ligero headlocks but Ohno powers out easy. Ohno taunts Ligero, then pie faces him. Ligero doesn’t back down so Ohno does it again. They tie up and Ohno puts Ligero in a corner. Ligero climbs up and uses the top rope to leap, but Ohno denies the arm drag to put Ligero in the corner. Ligero dodges Ohno and waistlocks then speeds up to sunset flip. Ohno stays standing and pries Ligero off to whip him to a corner. Ligero goes up and under then back in, but is put on the apron. He slingshots in, but into a BOOT! Ohno covers, ONE! Ohno grins as he stalks Ligero and fans rally up. He drags Ligero up to club him hard on the back. Ohno brings Ligero up for a CHOP! Ligero drops to a knee and Ohno toys with him. Ohno stalks Ligero then brings him up for a back suplex. Ligero escapes and boots Ohno to then rally with kicks. Ligero runs and tilt-o-whirls to throw Ohno out! Fans fire up with Ligero as he gets on the apron. Ligero leaps and cannonballs, but also gets steel steps to the face! Ohno may have just managed to direct Ligero that way! Ohno drags Ligero’s dead weight up and into the ring at 5. He taunts Ligero having an “accident” as he stomps Ligero out. Ohno drops elbows then covers, TWO! Ohno drags Ligero up and suplexes for a big slam! Cover, TWO! Ligero lives but Ohno keeps his cool. Ohno looms over Ligero and brings him around for a standing chinlock. Ligero endures as Ohno drags him around. Ohno drops back to bend Ligero over his knees! Fans rally for Ligero as he endures. Ligero pries Ohno’s hands apart! But Ohno brings them back to ear clap Ligero! Ohno drops knees right to Ligero’s face! Cover, TWO! Fans cheer as Ligero stays in this match. Ohno kicks Ligero while he’s down but Ligero keeps pushing back. Ohno clubs Ligero then stands on his hand! Then Ohno grabs the other arm, to stomp Ligero right in the head! Ohno mocks Ligero as he stands him up to boot him down. Ohno brings Ligero up again to boot him back down, and dares him to get up. Ligero does slowly stand, and blocks the boot! Ohno powers Ligero down but Ligero dodges the stomps and senton! Fans rally while Ohno glares. Ligero dodges and kicks away on Ohno’s leg! Ligero brings Ohno to his knees to knee him in the face! And again! Ligero gives Ohno a third boot, but he’s not done there! Ligero goes to the apron and climbs to springboard splash! Cover, TWO! Ohno survives and gets to a corner while Ligero sits up. Ligero whips Ohno but Ohno holds the ropes. Ligero SLAPS Ohno then whips but Ohno reverses. Ohno misses as Ligero ducks, Ligero grabs Ohno, but Sliced Bread is denied. Ohno prepares a gut wrench but Ligero victory roll counters, TWO! Ligero baits Ohno in and leaps up, DESTROYER! Cover, TWO!! Ohno survives again and slumps out of the ring. Fans fire up as Ligero builds speed and FLIES! Direct hit takes Ohno down! Ligero gets Ohno up but Ohno shoves him away. Ohno runs into an elbow and Ligero gives Ohno Sliced Bread to the floor! But the ring count is at 7! Ohno and Ligero crawl for the ring, and both get in at 9! Ligero springboards in but the stunner is blocked. Ohno goes after the mask! Ligero is busy defending his face, Ohno hits the Dream Crusher elbow! Cover, Ohno wins! The Knockout Artist redeems himself after losing to The Kiwi Buzzsaw but through cheating the Luchador of Leeds. Will Ohno move on to prove he’s the proper British style wrestler? Exclusive interview with Jordan Devlin. 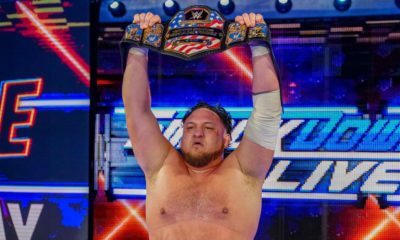 The Irish Ace will get what he wants: a match with the NEW WWE United Kingdom Champion, Walter. “What are my feelings on my big match with Walter next week in New York?” He’d normally be happy and talk a big game, but he won’t. Because to protect the rematch of the century of Dunne VS Walter II, this is a non-title match. Devlin isn’t a fool, he sees what everyone wants. 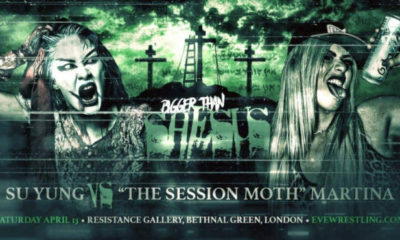 Everyone wants Dunne VS Walter to tear the house down again, but Devlin doesn’t. Devlin doesn’t care about what fans want. He doesn’t care about what Dunne and Walter want. Devlin vows to beat and hurt Walter next week so that he will be the undeniable challenger to that WWE UK Championship. He will show us all why you never bet against the Ace. The Hunt returns next week! The Wild Boar and the Primate will return, but who will be their next prey? Marcel Barthel & Fabian Aichner took a tour of Wrestlemania Axxess. To them, this was all just a circus. And what is this? Champ Yourself? Pretend to be champions with pretend belts? The European Alliances say that’s what exactly the problem is. Playing pretend with a fake belt and a fake ring, it’s disgusting. Look at this. The fake entrance ramp, too. Fans get to do what the wrestlers work so hard to earn? No one understands, but that is the difference between you and them. Because to them, this means so much more than anyone could ever imagine. To them, the ring is sacred. The Lightning from Down Under is in New York with her NXT UK Women’s Championship as she heads to the ring. “Welcome to NXT UK in New York City!” Toni feels so awesome representing this brand on the most important weekend of the year, Wrestlemania! And she successfully defended her title a few weeks ago in a close match. But that got her thinking. NXT UK is home to some of the most talented women in the world. She may not like her, but she’s had killer matches with Rhea Ripley. There’s Xia Brookside, Nina Samuels and even Piper Niven! But that said, this is Toni Storm, and she will be champion “for a long, long time.” The Mae Young Classic 2 winner is the second NXT UK Women’s Champion, but will she really be champion for much longer? But as Toni makes her leave, Kay Lee Ray makes her entrance! The other new addition to the roster wants Toni to remember she’s here. What will KLR do to make her mark in NYC? Kay Lee Ray VS Xia Li! It’s another crossover of NXT UK and USA as the Killer Lass takes on the spicy martial artist! 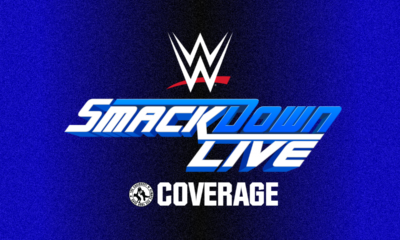 Who makes the biggest impact across both Women’s Divisions at Wrestlemania Axxess? The bell rings on this first-ever encounter. Xia and KLR tie up and KLR gets a wristlock. KLR gives a quick shoulder breaker, then wrenches again. Xia slips through to wrench back, but KLR spins to hammerlock. Xia reaches back to headlock, then takedown. KLR headscissors back but Xia pops out, and fans cheer this early exchange. KLR calls for a test of strength, but toys with Xia by switching hands. And then she shows her height advantage. Xia jumps up to get it though! She has the knuckle locks but KLR breaks free to wrench and yank Xia around. Xia rolls and handsprings to break free, but KLR stays away from those martial arts kicks! KLR uses the corner for defense, and Xia backs off, but KLR gets a cheap shot in. KLR throws forearms and then rams shoulders into Xia in the corner. She lets up at the ref’s count then whips corner to corner. Xia goes up and over and then comes back with a dropkick! Cover, TWO! Xia goes after KLR on the ropes but KLR holds ropes. KLR then wrenches to SUPERKICK and throw Xia into a post! KLR stomps a mudhole into Xia then drags her up. She forearms Xia hard but backs off as Xia gasps for air. Fans rally as KLR hammerlocks Xia to throw her back into buckles! KLR drags Xia up to snapmare to a seated stretch. Xia endures as KLR bends her back and digs knuckles into ribs. Fans rally harder and Xia pops out. Xia powers up and arm-drags KLR hard. KLR comes back for another hammerlock but Xia spins it around to throw KLR into buckles. KLR comes back but gets jabs and back hands! Xia gives KLR knees to the head then a leaping snapmare! Fans fire up as Xia kicks KLR in the back! Xia dares KLR to get up, swing and a miss but the heel kick gets her! Cover, TWO! KLR lives and Xia can’t believe it! Xia heads to a corner and hops up, then leaps, only for KLR to get under. KLR CHOPS and SUPERKICKS then back hooks to hit Widow’s Peak! Cover, KLR wins! And that’s 1-2-3 for KLR in NYC! The NXT UK Women’s Champion may have overlooked her before, but will she have to acknowledge KLR now? NXT UK Media found Piper Niven at Wrestlemania Axxess. The Scottish Viper was finishing up a meet ‘n’ greet as they noted her run-ins with Rhea Ripley. Rhea is definitely a phenomenal athlete, but Piper knows Rhea’s a bully. Piper doesn’t like bullies. Let’s see how Rhea likes it when she finds someone she can’t just push around. When and where will Piper and Rhea finally settle things in the ring? The Grizzled Young Veterans are throwing around the ring gear and luggage of Kenny Williams and Amir Jordan! Zack Gibson and James Drake are furious! Kenny & Amir haven’t done a thing to deserve their spots on this roster. GYV are locker room leaders. They are forcing the Lucky Yin and Bhangra Bad Boy to change in the halls! Will Gibson & Drake pay for being locker room bullies? Moustache Mountain VS Flash Morgan Webster & Mark Andrews! Tyler Bate & Trent Seven are good friends with the Modfather and the High-Fiving, Stage-Diving Welsh Rockstar, but that doesn’t mean friends can’t have a friendly match. Will it be the Big Strong Boys or the Welsh Air Force take the win in New York? The teams sort out and we start with Bate and #Mandrews with the bell. Andrews and Bate hear the fans sing as they circle. Bate and Andrews shake hands to show this is respectful. They tie up and Bate wrenches Andrews around to a wristlock. Andrews rolls and reverses the wrench to a standing armlock. Andrews brings Bate down to the mat but Bate powers his way up. Bate stands but Andrews wrenches again. Bate works his way out of the hammerlock and reverses back. Headlock takeover meets headscissors and the two stand off. Fans cheer as they approach again. Bate reels Andrews in to a keylock and down to the mat but Andrews denies the cover. Andrews knips up and uses ropes to flip through to an arm-drag. Bate blocks the next arm-drag but Andrews goes around to the other side! Andrews arm-drags Bate to an armlock and fans applaud. Bate works his way back up but Andrews brings him to the corner. FMW tags in and drops stomps on the arm. FMW wrenches Bate but Bate rolls and then back and then handsprings to dropkick! Bate grabs FMW and tags in Seven! Seven takes the hand-off and then scoops but FMW escapes. They collide shoulders but Seven doesn’t budge. FMW tries again but still can’t get Seven off his feet. FMW tries again only for Seven to use the momentum to rebound and run FMW over! Seven runs but things speed up, but Seven blocks the hip toss. FMW hits Seven in the gut then back flips to a drop toehold! Fans cheer as FMW gets a facelock. Seven powers up as fans rally but Andrews tags in. Andrews gets the hand-off and wrenches Seven. Seven breaks free to CHOP away on Andrews! Andrews wings, but falls for the feint and DDT! Seven covers, TWO! Seven smothers Andrews and tags in Bate. Bate headbutts Andrews’ ribs then snapmares him for a neck crank! Cover, TWO! Bate keeps Andrews from FMW with an arm wrench. Tag to Seven and Moustache Mountain coordinate for Wasteland to knee-board senton! Cover, TWO! Seven drags Andrews up for a scoop slam then drops a leg! Cover, TWO! Andrews crawls but Seven brings him back down. Fans rally as Seven pulls Andrews into a seated stretch. Seven shifts to a modified cobra clutch but Andrews works his way up. Fans rally and Andrews reaches for FMW. Andrews elbows Seven but Seven wrings him out. Andrews dodges and hot tags FMW! The Modfather gives Seven a knee trigger! Then triangle dropkicks Bate down! FMW goes back to Seven for the quebrada! Cover, TWO! FMW keeps going as he brings Seven up. He underhooks but Seven slips out, only to fall for the bait. FMW headbutts then underhooks again, but Seven back drops out. Hot tags to Bate and Andrews! Bate throws FMW down then blocks and kenes Andrews. Bate hops up to flying European Uppercut! Fans fire up as Bate goes corner to corner for another EuroUpper. He dodges FMW and then gets them both with a EuroUpper! Bate brings FMW up for the airplane spin! Andrews comes over but Bate trips him up for a swing! The Big Strong Boy shows off his strength, then dumps FMW on Andrews. Bate brings FMW up, double underhook is countered with a headscissors! Bate ends up on the outside, FMW DIVES but is CAUGHT! And taken for another spin! Bate tosses FMW at the apron for snake eyes! Bate returns to Andrews and catches him for an exploder! Knip up to standing Shooting Star! Cover, TWO! Andrews lives but Bate sees Seven. Tag to Seven and Moustache Mountain goes after Andrews. But Andrews fires off with CHOPS again and again and again, back and forth! But Bate and Seven kick him back then double whip. Andrews slides under to double PELE! Bate and Seven both end up outside and tag to FMW. The Welshmen both FLY and take down the Big Strong Boys! FMW puts Seven in then uses the Moustache Mountain corner to tag! The ref waves that off, but FMW still tilt-o-whirl DDT’s Seven down. They tag in their proper corner, and FMW gives Andrews the boost for the standing 450! Cover, TWO! Andrews grows frustrated but keeps on Seven as fans rally. Andrews brings Seven up but Seven CHOPS! And CHOPS! And again and again! FMW comes in but he gets a CHOP! FMW falls for the feint now, and Seven passes him to Andrews. Seven CHOPS Andrews and makes him DDT FMW! Hot tag to Bate! Moustache Mountain has Andrews, Rebound Lariat Dragon Suplex! Cover, but FMW SWANTONS it apart! 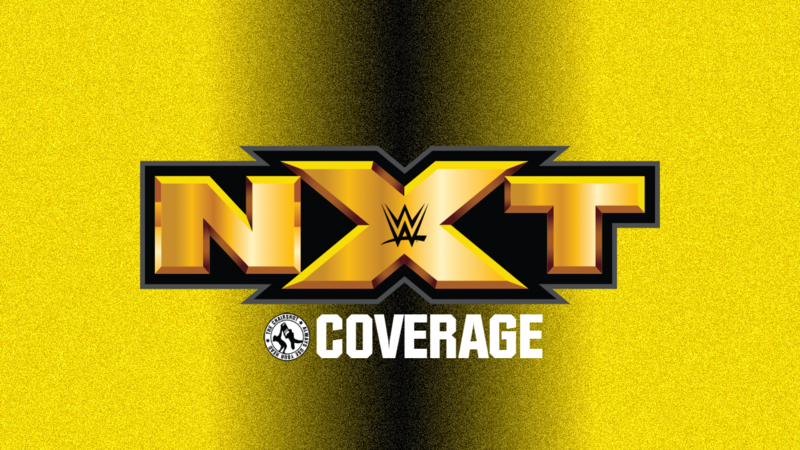 Fans are thunderous for “NXT! NXT!” as all four men regroup. Bate grabs Andrews and drags him around for a EuroUpper and some right hands. Andrews forearms and chops back, then picks up speed as he hits from all sides! Bate shoves, Bop up, BANG hits! FMW tags in and Andrews reverses the whip. Bate rebounds but misses the lariat, gets a knee-trigger reverse-rana!! Cover, but Seven breaks it! FMW drags Bate over and underhooks, but Bate spins out. FMW baits but BANG hits! Tag to Seven, and Seven back hands FMW into a BIG dragon suplex! Tag back to Bate, and MOustache Mountain combine for the flying knee burning hammer! Cover and Seven intercepts Andrews! Moustache Mountain wins!! Bate & Seven take the win after a grueling match! Will Moustache Mountain use this to climb back up towards the NXT UK Tag Team Championships? Another great episode of NXT UK in New York. We open with a nice bit of action of Ohno VS Ligero. A good match and it was best for Ohno to win so that his story doesn’t fall flat. Of course, he probably should’ve won against Travis Banks last time for the same reason. A Heel’s mission of establishing their own philosophy only works if it doesn’t fail until the very end. Or if it fails over and over. Either way, Ohno should’ve been on a different streak than 50-50 booking. Toni Storm had a good promo and it was timely for Kay Lee Ray to show up to bring up that she’s around. KLR VS Li was good, and naturally the NXT UK superstar wins. KLR very may well be Toni’s next challenger given Rhea VS Piper is happening and there aren’t other women ready to challenge Toni. Devlin’s interview for his coming match with Walter was well done. 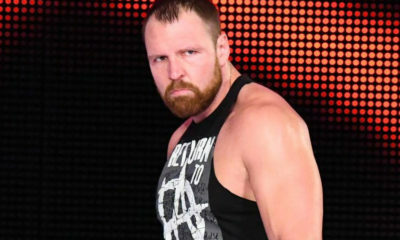 It’s good story to have him be upset he’s not getting a title shot first, but who knows? Maybe he does well enough that Johnny Saint will have to grant him a shot. Maybe a triple threat for the title? Or Devlin takes on the winner of Walter VS Dunne for a rematch either way. GYV had a decent promo with throwing around Kenny’s and Amir’s gear. It still seems like their tag title match will happen after all, but I’d think GYV still wins. Moustache Mountain VS Andrews & Webster was incredible, worthy of a tag title match in itself. 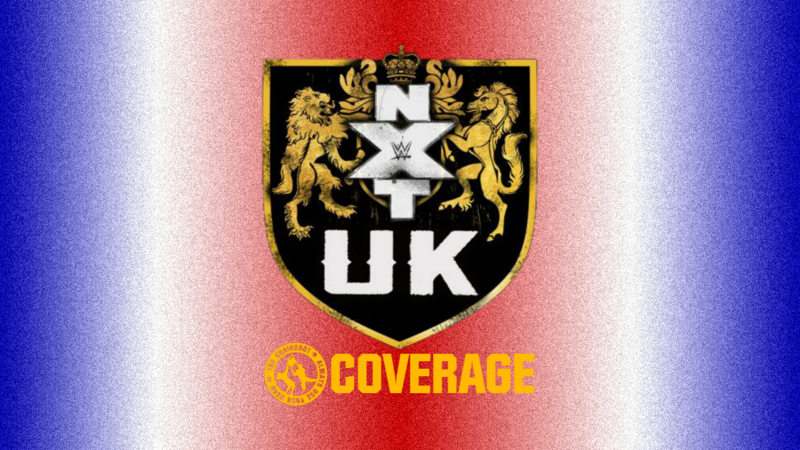 Bate & Seven win and should be the proper second tag team champions for NXT UK to parallel Dunne’s own reign as the second-ever WWE UK Champion.